More than half of America’s coastal wetlands, approximately 120 million acres, have disappeared since 1900. Why has this happened? Human population pressures, pollution, development and climate change are the primary reasons. Loss of wetlands has resulted in depleted fisheries, destruction of shellfish beds and other habitats, as well as degradation and compromise of coastal environments and economies. On Long Island, a 2004 U.S. Fish and Wildlife study estimated that Nassau and Suffolk Counties have lost roughly half of their wetlands since 1900 (from 82,000 acres at the turn of the century to 43,000 acres in 2004). Nassau County has lost over half of its wetlands (including 62% of its tidal wetlands) while Suffolk County has lost 39% of its tidal and 51% of its freshwater wetlands. With more land being developed alongside impacts of increasingly severe storms, one can only surmise that current wetland losses are even greater now than in 2004. 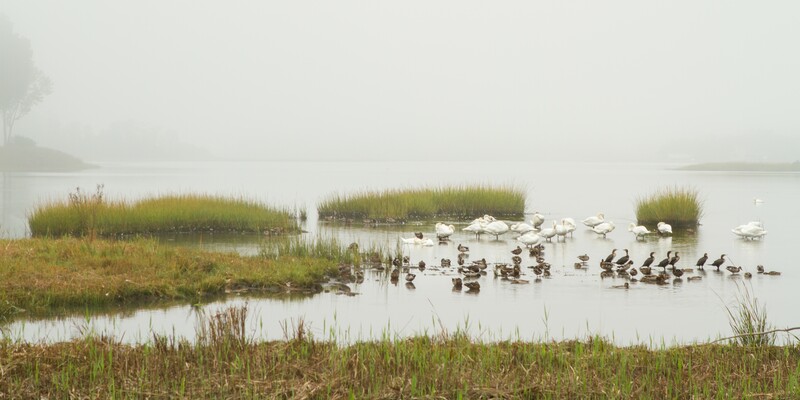 The protection of wetlands is very important to all of us who live on Long Island. Therefore, we are very pleased to report that the Braunstein family of Lattingtown is in the process of placing a conservation easement on nearly six acres of land bordering Mill Neck Creek. This donation will contribute to preserving myriad conservation values of Mill Neck Creek, Long Island Sound and the Oyster Bay/Cold Spring Harbor Complex. Mill Neck Creek is entirely within the 3,209-acre Oyster Bay National Wildlife Refuge, the largest (by far!) of the refuges that make up the Long Island National Wildlife Refuge Complex. The Refuge includes subtidal (bay bottom to mean high tide line) habitats, saltmarsh and a freshwater pond and receives the most public use of all the refuges. It is especially important for wintering waterfowl, such as black ducks, greater scaup, bufflehead, canvasback and long-tailed ducks. A variety of other water birds, including shorebirds, terns and cormorants also use Oyster Bay. Other marine organisms common to the Refuge include northern diamondback terrapins, harbor seals, sea turtles, finfish and shellfish. Mill Neck Creek is part of the Oyster Bay and Cold Spring Harbor Regionally Important Natural Area (RINA), identified by New York State in the Long Island Sound Coastal Management Program. Many thanks to the Braunstein family for their contribution to the health of our community and to the Souther family who lived there before them. Eugene Souther, a great friend of the Land Alliance, made a good choice in selling to the Braunsteins. He had always hoped this land he and his late wife Gretchen loved would one day be protected in perpetuity. If you live along this extraordinary place and are interested in protecting your waterfront area, we would love to hear from you.